Doh I haven't updated in a month! Sorry about that! I figured since there was really no official news after the end of Sasuke 29 I figured I can take a break. I ranted enough about the 2nd Stage Backstream anyway so I'll give that a rest. 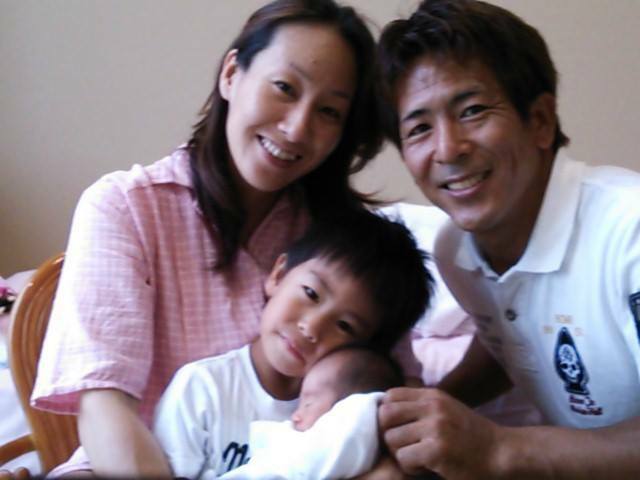 Either way as I posted before there's a new addition to the Nagano family! This family photo was taken last month. I love this photo along with the corresponding video of Kaiou demonstrating his skills on it (btw for the record Kaiou just turned 4 years old). Also for the record, I grew up with these things (and still bear the scars.. LOL) because I grew up during the big Kungfu Boom of the late 1970's/early 1980's (difference was that mine were made of wood..). Btw those nunchuku were made by Nagano himself one day when he got bored during some downtime on the boat. Friggin' sweet skills if you ask me. I.. love this photo! First off is the elusive Matsuda coming out of hiding! (although he looks burnt LOL) Just 3 (of the 5) UNCLI members hanging together out at the beach. My dream is to get all 5 of them in ONE tournament. Luckily we got Keita finally getting some experience on the main course (that wasn't Junior Sasuke). So we can still hope! Either way it's nice to see their are still fast friends and still representin' as fellow UNCLI members after all of these years. 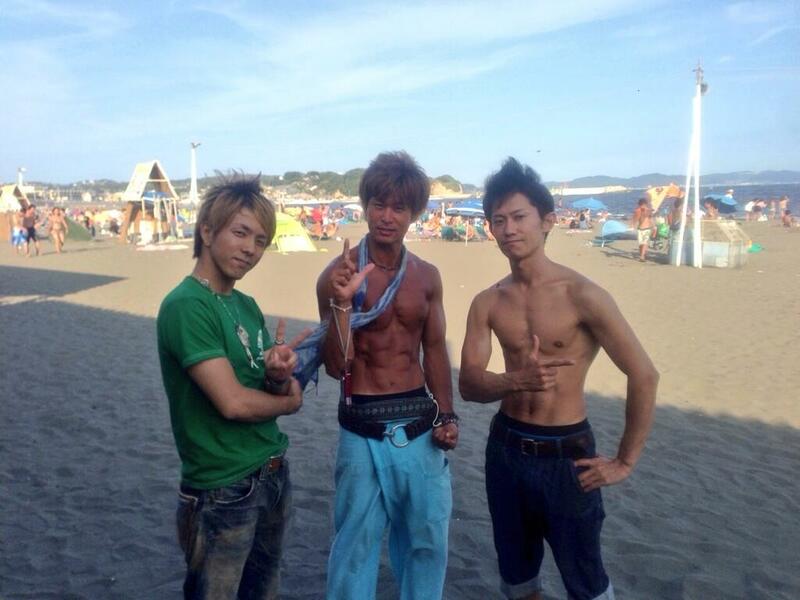 Next up are fellow STQ'ers hanging out also at the beach (which Kawaguchi being the one burnt!). 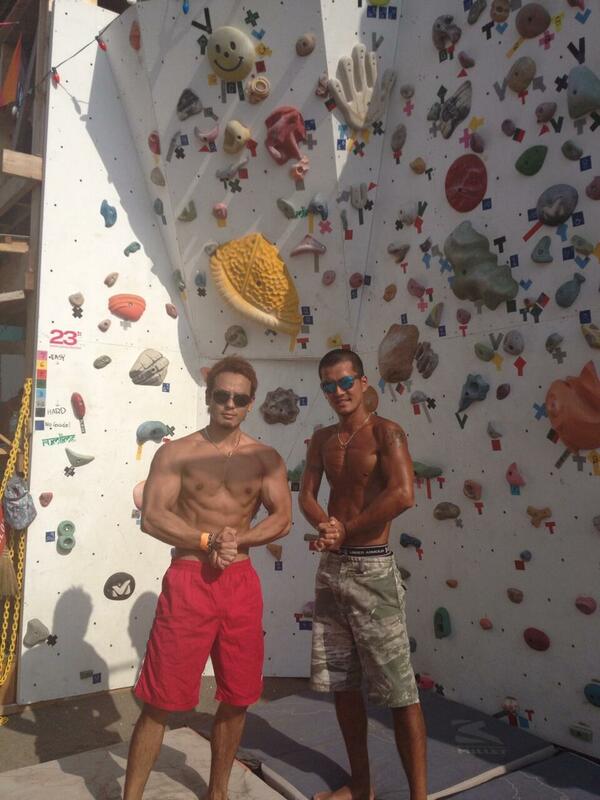 I mean.. what beaches around here have rock climbing? We totally have to get with the program in the states.. LOL Again, I love seeing fellow STQ'ers hanging out with each other outside of the tournaments. 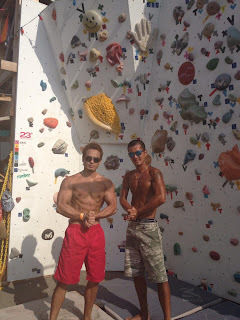 Another All-star who is ridiculously prolific on social media (this time Facebook) is Shingo. This adorable dog is Coconut! (appropriately named) He carries that dog everywhere! (yes.. he even Paris Hilton's that dog in a bag when he goes golfing...) For the record Shingo has always brought his dogs to Sasuke. 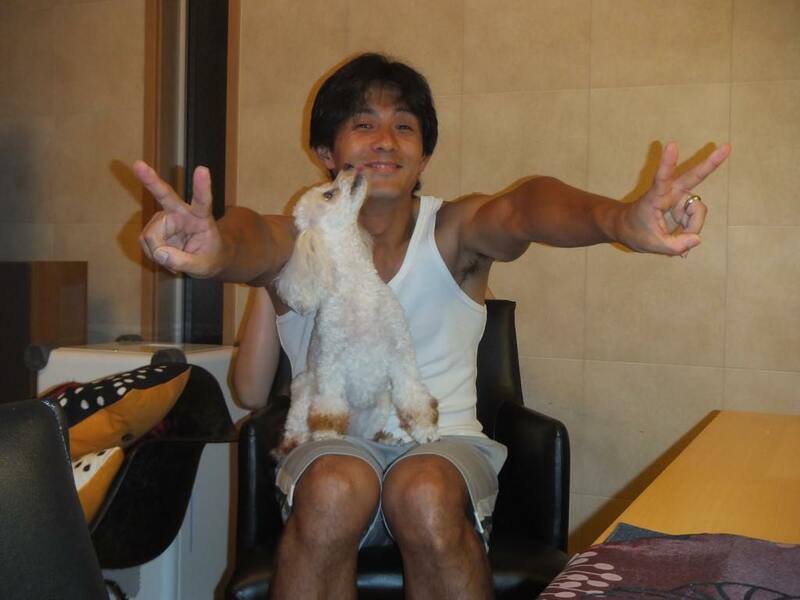 The previous white poodle he had for a number of years was his dog Sasuke. The last friggin' sweet photo is from Sasuke 29. So far no official word on who else is on the Japanese team joining Morimoto in the Sasuke ASEAN Open Cup in November. Once we get more details I'll let you know. We also don't know the official airing of the Japan vs. USA special from ANW5. No idea if NBC will carry than and no idea when TBS will air in Japan. Plenty of rumors and whatnot but still too far out to know anything definite. I'm hopeful for the next few months to hear more concrete news I can post. As always thanks for the update . Its good to see Shunsuke Nagasaki back . 1. Ryo, I love you. You actually prove that Matsuda still exists, and you provide us with Yuuji fanservice. (thumbs up) Oh, and we have proof that your hair will no longer blind people. 2. I don't know why I'm not shocked by seeing that Nagano can make his own nunchucks or that Kaiou is already in training for his place in the ninja midget army. I hope Kongu doesn't see this... Also, I love the full family picture, although I'm not sure if Kaiou's happy about it (dude, I understand, being the eldest is a pain (g)). 3. Why don't STQers know about sunscreen? 4. Shingo is a dork. Bless him. 5. Re: ANW/Japan - NBC really should air it after the finals are done, although knowing them they might just air it on G4/Esquire. It doesn't make sense for that to totally be standalone on the American side. Maybe the two hour block on NBC on Labor Day might get enough of Vegas shown that the ANW/Japan episode can be the finale. Do we just have two more weeks to go for ANW, or three, as I can't remember? As for the ASEAN Cup, I'm surprised that we still haven't heard anything about the full roster yet, since the original bit in Sasuke to check the homepage for the roster felt like that was going to be up shortly after the Sasuke airing. I wonder what's causing the delay. The ASEAN Cup airdate might determine when TBS airs ANW/Japan as well, since you could tie them together thematically as being Japan versus other countries. I think I know what you're thinking at pics 3 and 6...LOL!